Does your design guide its viewer or participant on where to look, and how to "travel" through the created design presented? 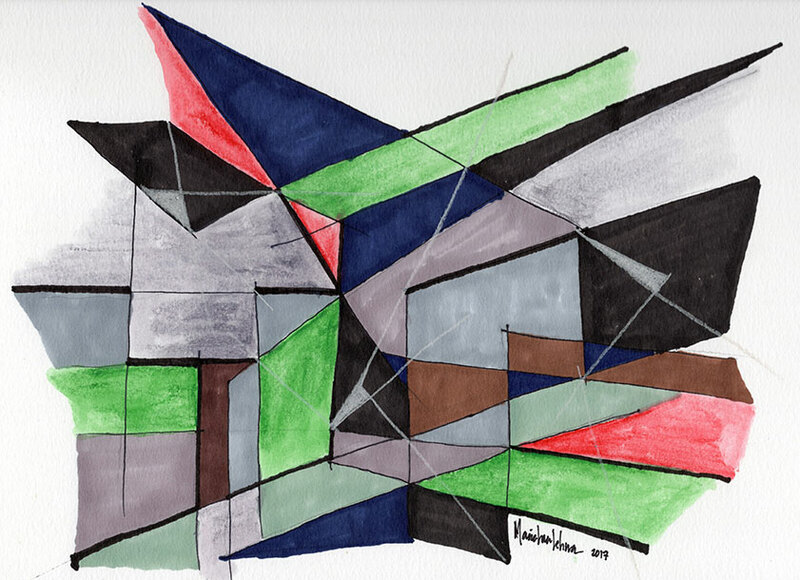 This sketch drawing entitled ViewPoint, is an exploration in drawing not only by playing with perspective and viewpoint shifts, but also by pulling one's eye to bounce around the dynamic colors of geometry. (Thus, drawing compositions and drawing a viewer's eyes.) Without actually being in motion, this drawing feels full of dynamic life. One can see depth in different places, and as one's eyes move about the sketch drawing, the depth of spatial constructs presented seems to change. This design project brings up questions of complexity in design ― where it can be used to provide variation and evoke curiosity where one keeps looking to uncover more dimensionality over time. The longer one sees this work, the more one sees in this work. This is when and how design complexity works best.